You’ve probably already heard about the benefits of a walking desk, also called a treadmill desk. These benefits include not only increased health, but also increased brain function, which can yield increased productivity. But when I looked online to see how much walking desks cost, I was bowled over by the prices: $2000 at the low end, and on up to $4500 and more. I couldn’t find anything on the used market in my area, and I didn’t have that kind of money to spend. A treadmill is one of those things that a person often buys with good intentions—and then rarely uses. Perhaps she or he intends to run a 10k race, then trains for the race, and then after the race is over, the treadmill becomes a $2500 laundry drying rack. In other words, these good intentions are often paired with poor follow-through. “I would like to buy a used treadmill,” I said. It took a while to convince him I was sure. I definitely wanted to buy the most expensive, fanciest, newest, and most well-made used treadmill they had in stock. Its MSRP, when I pulled up the model on my phone, was $3000. I’m a huge fan of the 90% discount. I headed to the hardware and lumber store. I purchased two, pre-finished closet shelf boards. Each board was 48” in length, 1” in thickness, and 12” in width. They cost about ten dollars each. I also bought some small L-brackets, screws, and small clamps. Total expense: Less than $30. Board A would be the main desk surface, just as it was. Board B would serve two purposes. Using my miter saw, I cut down Board B and made cleats to hold Board A on the horizontal arms of the treadmill. When that work was done, I had a 48” x 12” board lying across the treadmill’s arms, creating the main workspace. 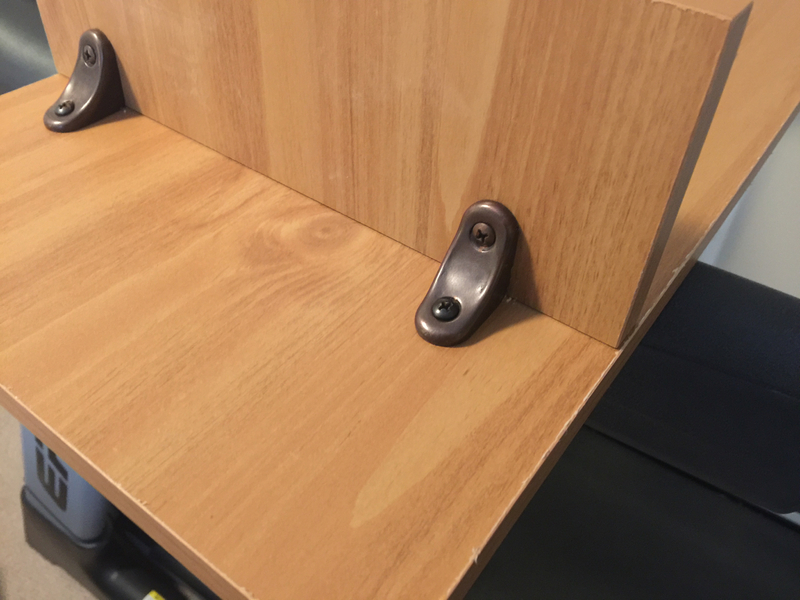 This desk surface was held firmly in place by cleats and L-brackets. Then I used the rest of Board B and the rest of the L-brackets to build a box to set on top of Board A. The box was exactly the right height for me to work on my laptop when I set it on top of Board A. The box was about 8” tall on the sides, and about 24” wide. (Note: I’m 5’11” tall.) I clamped that box to the top of the middle of Board A.
I put my laptop on top of the box, my work supplies under it (inside the box) and to the side (on Board A), and got to work-and-walking. You’ll find some naysayers who swear you should never work regularly on a laptop—whether at a sitting desk or on a treadmill desk. (These people must not spend much time in coffee shops.) I like working at my laptop. But if you, personally, need to use an external keyboard for your ergonomic happiness, you should build a two-tier system that works for you. 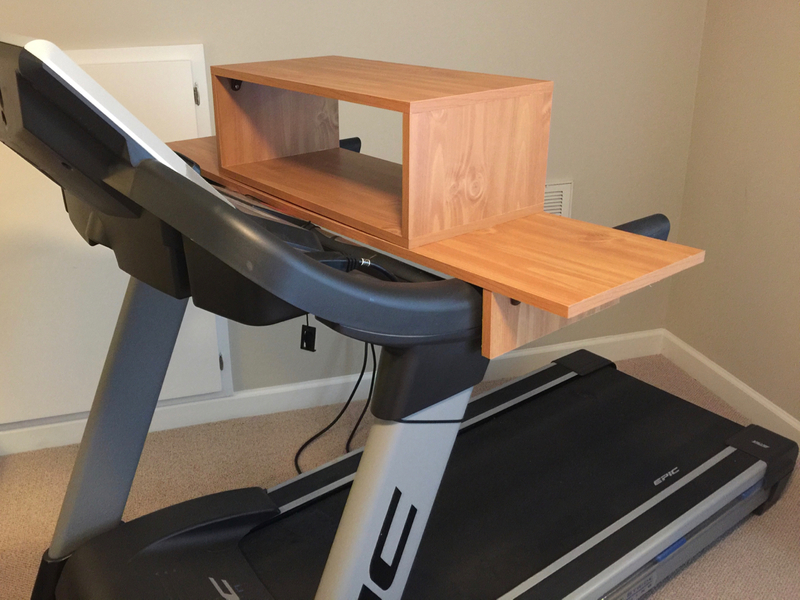 Now that I have my treadmill desk, whenever I have a spare 20 minutes, I walk instead of sitting on the couch. It’s also a great place to take phone calls. With a treadmill desk, one suspects that you are upping your metabolism while listening to a conference call—and you’ll find you’re just a little less resentful of that conference call. Blame the endorphins if you’d like for the extra chill. I just like the fact that I’m finally winning the step-count contest. Disclaimer: Please exercise caution when building and using a treadmill desk. These instructions are meant to be informative only and are not meant to take the place of your own judgment in building and using your desk.